Earlier this year I was granted a second interview with JetBlue regarding its book vending machine program. 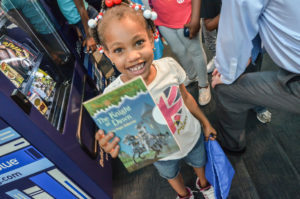 JetBlue piloted the program and an associated study in southeast Washington DC seeking to determine whether or not making books more readily available to neighborhoods like Anacostia would increase the reading skills of children living there. The following interview with Dr. Susan Neuman of the University of Michigan was previously unpublished as it was conducted and finalized just before the Examiner shut down its operations. At the time of the interview, JetBlue was readying the second phase of the vending machine study in addition to expanding it into other cities such as Detroit. During the summer of 2015, JetBlue and Random House embarked on a study as a part of the airline’s “Soar with Reading” campaign. The study looked at whether or not increasing the availability of books to residents in “Book Deserts”, could reverse the low reading levels and perceived interest in reading typically associated with lower income neighborhoods. On June 9, 2016, JetBlue granted interviews to discuss the initial results from its Book Vending Machine Study headed by collaborator, Dr. Susan Neuman, who has conducted extensive research on book deserts across America, and Icema Gibbs, JetBlue’s Director of Corporate Responsibility. In the first interview Susan Neuman discusses the program’s initial findings. In the second interview Icema Gibbs also discusses the study findings, in addition to Jet Blue’s plans to expand the Soar with Reading Program into Detroit, MI. Anwar Dunbar: Hello Susan. The last time we spoke, you all had started the book vending machine program in the Anacostia neighborhood of Washington, DC. A year out from starting that program what have you found? Susan Neuman: So just to recap last year, we did put book vending machines in high traffic areas based on our previous work. So we asked, ‘Where do people go and where might they hang out with one another?’ At the same time we picked what we call “Counterfactual” sites; sites where there were a lot of people who would walk back and forth, but just in different areas. We put the book vending machines at: a Shop Rite, Saint Matthews Memorial Church, and then a Wellness Center/Salvation Army. Our job as researchers was to do was to examine how these machines were used, how often they were used, and the effects on those who used them versus the people at the counterfactual sites which did not have the vending machines. There was a tremendous outpouring of interest from people who saw these vending machines. They know how to use them because vending machines are a part of our society, so it wasn’t hard to do. We found that people really used them, and in eight weeks’ time, 27,000 books were downloaded, used and selected. We also noted some very interesting conversations between the parents and their children, or maybe the grandparents and children including, “Which books did you choose? Why did you choose this particular topic?” We also overheard lots of other interesting discussions including, “Oh my gosh, this is so needed. We needed this in our community.” So the vending machines were really used towards the end of August when school was looming ahead. We found that there were even waiting lists and waiting lines. People would stand in long lines in order to get books. So it was a tremendous success, in terms of participation. At the same time we found that parents and caregivers recognized the titles of books more frequently, so they were able to identify children’s books. And that’s really important, because when you go to a library it’s often hard to know which books to get. They knew titles which are especially important for the counterfactual areas. And they reported reading more to their children. So, in short, those were the effects. We saw no damage and no problem at all with the machines. They were pristine at the end of the experiment and they showed how much the people cared about books. AD: That’s interesting. Yes, a natural concern would be what would happen to the machines once they’re put into certain areas. I want to ask you about the counterfactual sites, but first an obvious question would be which books did you all supply at the locations? Were they the Magic Treehouse? Harry Potter? Chronicles of Narnia – something like that? SN: There were a wide variety of books that Random House collected and donated. I’m sure some of them were overstocks. But JetBlue really made an effort to make sure that there were multicultural titles – titles with lots of African American authors as well as main characters. Many of these books had African American characters on the cover and that was really important because we wanted children to be able to identify with characters that could be important to them. The other thing that we found was that it wasn’t just the very early education age groups who were interested. That was the assumption that we had – that books would be picked out that were solely for babies and toddlers, but that wasn’t the case. Even the teenagers would use the vending machines and they would download a sizable number of books. So that was very heartening. Regarding the counterfactual sites, we picked areas that we thought were high traffic – not terribly close because we didn’t want to see any type of bleeding, if you know what I mean. One of the sites was a CVS Pharmacy. One was close to the metro station. Another, I believe, was a 7-Eleven. AD: Did you say bleeding? What’s the context for that in this instance? SN: Well, what I mean by bleeding is that the same people could go to counterfactual sites and the vending machine sites and we didn’t want that to happen, especially in a place like Anacostia. What you find is that people traffic around a particular area – they lived around Main Street, for example, and that was a key traffic area. We tried to pick a place that wouldn’t be a key traffic area – somewhat removed so that we wouldn’t get responses from the same person in different areas. AD: So the significance of the counterfactual site is that it was your control site? What’s the significance of that name? SN: It was. It was like our control group. We don’t call it a control group because control indicates more control. We basically call it counterfactual – similar to a neighborhood, but did not have vending machines there. AD: And so did you all test a certain number of weeks or did this go on throughout the school year as well? SN: Just the summer. We were interested and concerned about the “Summer Slide”. You’ve probably heard about that, but generally kids who live in poor areas – their scores go precipitously down because there’s just a lack of resources. What we had noted in our previous year was that Anacostia is a little bit like a book desert – there aren’t resources for children when libraries are closed. Interestingly we found that this particular population did not use the library a lot. We suspected that was because libraries have fines and that patrons are worried about paying those fines. That was another real benefit of providing books and giving them a great deal of choice. The book titles would change every two weeks so we got lots of repeaters. A lot of people who would come back and use the vending machines over time. AD: So you said that you had a questionnaire. Was it designed to gauge how the experience was or were you looking to measure something? SN: We were looking to measure a couple of things. Number one was: who they were, their reading habits, and how many books they had in their home. By in large the population is very predictable. They don’t have very many books in their home – less than 25 books typically. It’s a small number and so our questionnaire was basically interested in finding out more about them. They wanted to read and they just did not have books. There was a separate questionnaire that was designed to determine whether or not they recognized book titles. Recognizing book titles is an indicator that they are paying attention more to children’s books and children’s literature. And that is likely to enable them to select a book for their kids. AD: So what’s the conclusion for this work thus far? SN: I think the conclusion is that if you put books in they will come. We want to convince proprietors that if they begin to stock books, people will buy them. We can’t make that presumption because we gave books to them in this instance, but our preliminary findings indicate to us that people really do care about reading, and it debunks the notion that parents don’t care about this for their child, and they don’t want to read to their children. What we’re arguing is that there are structural inequalities in certain areas and neighborhoods preventing parents from doing what they really want to do, which is to help their child, and I think that’s a very important message. There’s a lot of blaming of parents that, “They don’t do this, they don’t do that. They don’t talk to their children.” All of this very deficit language and we’re trying to convince people that it’s not true. How can you read a book to child if you don’t have one? So what we’re saying is that if they have books, they will read them. That should provide proprietors with an indication that maybe they should stock some books for a change and see if parents will buy them. I predict that they will because they care deeply about their children and they want their children to succeed. It was very interesting, Anwar, just an anecdote. We did a lot of interviewing and we asked parents, “What would you like to see if we were to do this again? What would you like to see more of?” They said, “We’d like to see more workbooks in these vending machines.” I thought that was fascinating because many of us say, ‘Well, workbooks aren’t terribly great for children,’ but it shows us how much parents care. They want workbooks because they want their child to be ready for school. And if you can highlight that, I would really appreciate that because there’s a lot of blame going on which I think is very detrimental to these families and it’s unfair. The other thing is that this year we’re now looking at child outcomes. We are now going to be back in Anacostia in the coming year and we’re doing a study to compare children’s vocabulary over the summer to see whether we can stall the summer slide. If they have books will their vocabularies at least stay stable or will it grow over the summer when it generally goes down? That’s what we’re specifically looking at this year. AD: In this last set you asked them how using the machines went, but you didn’t do any scoring in terms of rating their reading level or their ability to spell. Is that correct? SN: No, we didn’t do that last year. Last year we focused on the parent. This year we really want to focus on the child. It’s a three step process. First we documented that there’s a Book Desert. We then said, ‘Okay if you change that Book Desert what happens?’ We found that parents will use the book vending machines and get books for their children. This year we want to see what the impact will be on child outcomes. AD: I have two more questions. It sounds as though you think the proprietor is the person to court here in terms of reversing this trend. Should government elected officials have a role in this in terms of allocating more money for this type of effort? SN: Yes, of course we do think that. You know there’s a new opportunity to learn language in the Every Student Succeeds Act (ESSA) law. I hope that Icema will begin to do this, but we would like to see that opportunity to learn focus on having access to books. There’s all of this talk about digital access and stuff like that, but the good old book is how children begin to read. So yes, we’re hoping to affect the opportunity to learn language with the new ESSA law. And yes, we are trying to convince proprietors to step up because JetBlue can’t do this forever. Proprietors have got to begin to stock books and recognize that people will buy them. AD: My last question is – are you all going to publish your initial findings in an academic journal in multiple parts, or are you going to wait and publish everything together? SN: Yes, we have one article coming out already in Urban Education, which is about the Book Desert. We’ve submitted this year’s project to a journal and we’re waiting to hear back from the periodical. We will definitely be putting the third phase into a journal when it’s done. That’s what Academic’s do (laughing). AD: Okay, well there will definitely be people who will want to read about this work, track the timeline, etc. SN: Well, you always have good questions. AD: Thank you, Susan, and I definitely appreciate being able to help you all get the word out about this important effort. In part two of my interview with JetBlue, Icema Gibbs discusses the expansion of the book vending machine program into other markets in addition to what local proprietors can do to make books more readily available to their patrons. If you liked part one of this interview, please share it, and leave any thoughts and comments below.